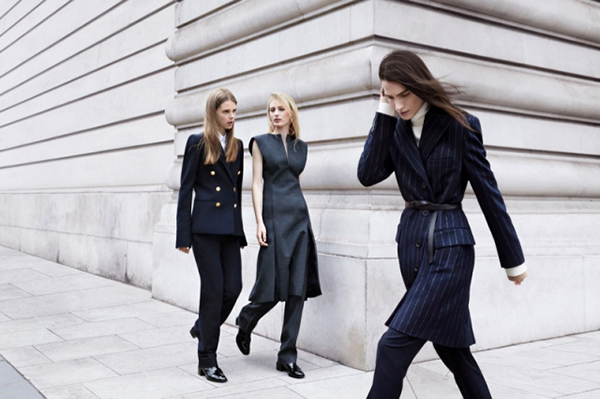 Zara has revealed its Fall 2013 campaign, featuring Julia Nobis, Juliane Gruner, Caroline Brasch Nielsen, Mijo Mihaljcic and Ashleigh Good. Gorgeous outfits from the new collection and refreshing beauty of the young models create quite a striking impression. The brand definitely knows how to capture our attention and make us crave each of the presented pieces. Patrick Demarchelier lensed the beauties on the streets of London, whereas Marie-Amélie Sauvé styled the stunning looks. Whenever there are multiple models posing, the campaign inevitably becomes very interesting. The more we have to look at, the better it is. Especially, when it is not only about the pretty girls, but also about amazing clothing items designed by a high street fashion retailer. The style of the photo shoot varies from a preppy classic look with white shirts and elegant pantsuits to glam chic and feminine floral ones. My favorite image of the campaign is a photo featuring four seductresses wearing black dresses with lace accents and saucy hats in dark shades. Two of the ladies don coats over their frocks, which also looks very cool. Those hats add some mystery to the outfits. Seems like the ladies are plotting some kind of an affair and getting in their way is incredibly dangerous. 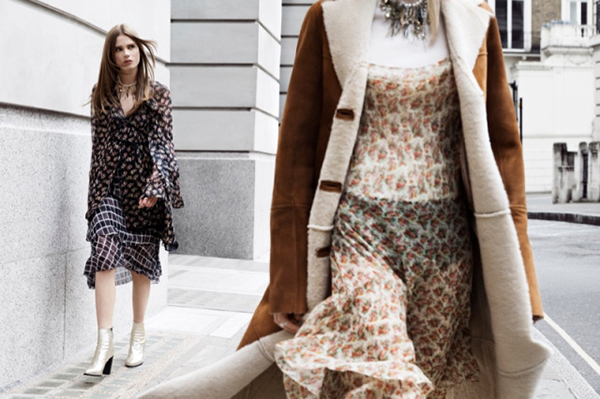 Zara Fall 2013 ad campaign offers sheer maxi dresses with a floral print as well as various jackets to keep your bodies warm. I fell in love with the pleaded skirt in cadet gray, which is paired with a cream jacket and black gloves. Just the idea of wearing gloves makes me sick, for this accessory embraces your manicured hand when it is chilly outside, and I hate to think about cold weather. Nevertheless, this look appeals to me a lot and makes me plan my monthly budget way ahead of the pay day. All the clothing pieces that you spot in Zara Fall 2013 campaign are super trendy and stylish. Check out more looks of the ad and start saving some money for your incredible purchases.